All the “major” bars in Cabo are located downtown, within a few blocks of each other along the same street. This makes bar hopping incredibly simple. These bars have become synonymous with a good time in Cabo for many of its visitors. 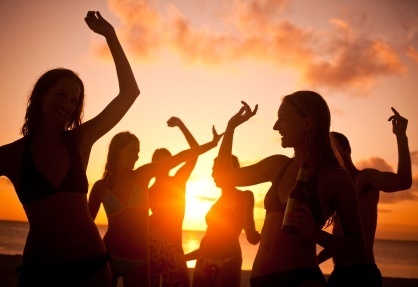 Many of them play a variety of American music, so it’s likely that you will hear plenty of old and new favorites on a night out in Cabo. There are also plenty of taxi’s that patrol the area, so that you can get home safely! There are a few different types of bars that you will find while looking for your ideal Cabo nightlife spot. There are a few “spring break” type bars, like Squid Roe and Happy Endings Cantina. Squid Roe has 3 tiers, plenty of bars, and is crowded on even the slowest of nights. Happy Endings Cantina has a few beer pong tables, as well as great drink specials that help you save money on your night out. Next, there are two “club” type bars in downtown Cabo, Pink Kitty and Mandala. They are located within a block of each other, feature large dance floors and plenty of seating, tables, and areas for bottle service. Cabo also has plenty of smaller bars that don’t serve food, and lack the overall floor space of some of their crazier counterparts. However, for what they lack in dining options and square footage, they make up for with originality and specialty drinks. Bars like the Nowhere Bar, Cabo Blue, Elbow Room, Jungle bar, and Rip’s would fall into this category. If bars are not your thing, there are a few other options for nightlife activities. There are a few restaurants, especially around the marina, that are open late night for dinner or deserts. There is also a hookah lounge, called Fumari, for those who enjoy hanging out while smoking flavored tobacco. A few of the bars and restaurants also feature live music and shows. You will generally be able to find some kind of live band playing on the weekend in Cabo Wabo, as well as some entertaining shows going on at the Giggling Marlin. Passion Club: The ME Cabo’s upscale nightclub.